These are often called Grizzly Quills. 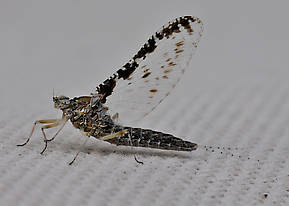 The speckle winged Callibaetis genus contains on average the largest species in the Baetidae family with hatches ranging in size from 20 to 12 (6mm to 12mm). However, most can be matched with 14 and 16 imitations. They reside only in very slow weedy sections of rivers or lakes and ponds. The most important are the sub-species Callibaetis ferrugineus ferrugineus in the East and Midwest and Callibaetis ferrugineus hageni in the West. It is in the West however, where this genus achieves its densest populations and most significant hatches. Other important western species also happen to be at both sides of the size scale. The outsized Callibaetis californicus can produce excellent hatches. The diminutive Callibaetis pictus can also be locally prolific, especially at higher elevations. 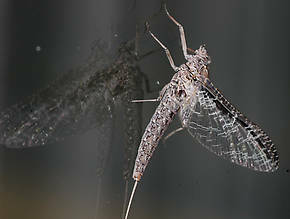 The duns are easily recognized by their speckled bodies and distinctive wings usually featuring a dark background overlaid with white veins. Female spinners are also easy to recognize with their clear wing's leading edges marked with dark blotches -- see the pictures. 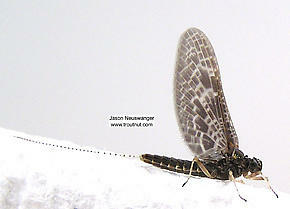 Callibaetis ferrugineus (Speckled Dun) Mayfly Adult View 3 PicturesThese adults are probably C. ferrugineus.